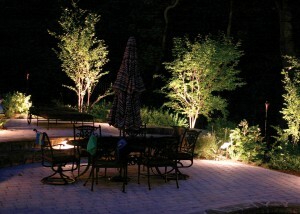 Avon Electrical Ltd provide the fitting and installation of garden Lighting & External Sockets in Burnley. Our highly skilled and vastly experienced electrical installation team can install a range of garden lights and outdoor power supplies. When a 230 volt outdoor light is incorrectly selected, installed or even damaged it can cause electrical shocks, resulting in serious injury or death. Maybe you are considering having some outdoor lights fitted around a decked area or on a patio or maybe even around a pool if so then contact Avon Electrical Ltd Burnley to discuss the safe installation of your garden electrical fittings. Over the years we have honed our skills on providing lighting and power to sheds, garages, ponds and gardens for both decorative and security reasons. Avon Electrical can also help improve your garden by installing a range of fittings such as pond pumps, external sockets, driveway lights and underwater lighting and our team can also repair existing outdoor lights and external sockets.